This item was introduced in E-Prime 2.0 (2.0.8.67). E-Prime offers the ability for industrial partners and end-users to offer experiment templates when creating a new paradigm. The templates can be categorized to easily filter them. 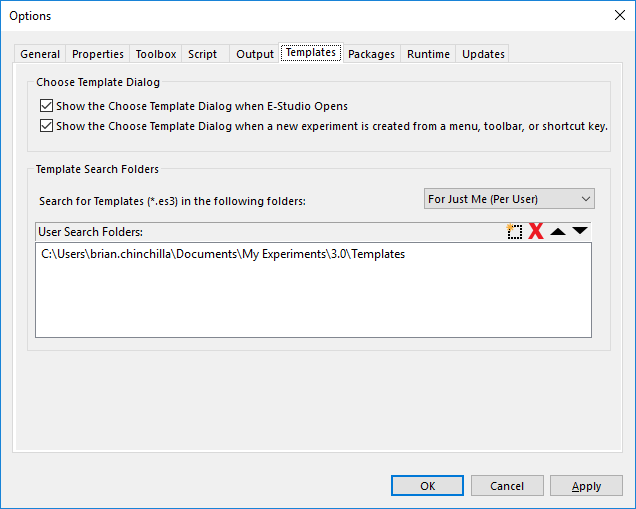 The 'Choose New Template' dialogue appears when of E-Studio is opened or during a File > New operation. Additionally, this dialogue can be disabled via Tools > Options. 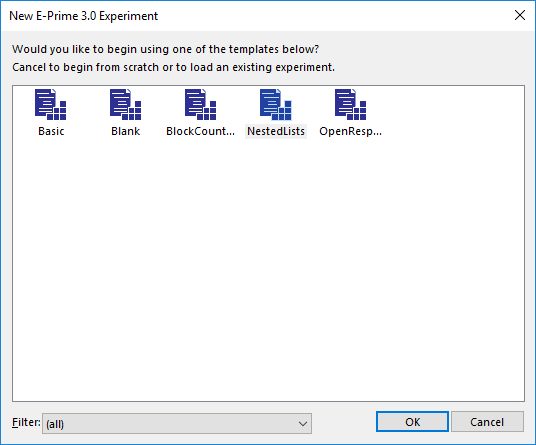 End-user templates can be saved in the <Program Files>\PST\E-Prime 3.0\Templates folder. In addition, template search folders can be setup per user and per machine through the Tools > Options menu. By inserting a template.xml file in the same folder as a template search folder, the name of the category filter in the 'Template' dialogue can be customized. By default, the dropdown box will use the same name as the parent folder the search is set to look into.